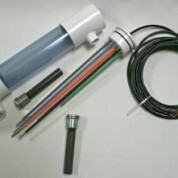 Waterline Controls stands apart from Flowline Ultrasound level measurements controls in several key areas. Flowline uses Ultrasound or Ultrasonic sensing (Non-Contact level controls) in its water level control systems. The major differences between WaterLine Controls and Flowline is the difference in the technology, FlowLine uses Ultrasound technology. WaterLine Controls uses physical probes that do not corrode, foul or deteriorate. Perhaps the most common use (from the general public’s point of view) is in sonography where pictures of fetuses in the human womb are generated. In the industrial environment, the use of ultra sound is generally used in two areas: 1) Detecting material flaws and 2) Measuring the level of a material within a tank or enclosure. These materials may be either a solid such as grains or a liquid such as fuels. The reflective nature of the fuels, water or walls can create false levels and indications, providing erratic readings to these types of devices. You can read more about Ultrasound Sensing advantages and disadvantages here. Never replace a level controller again!